Korean rules are nearly identical to the Japanese rules. Both use TerritoryScoring. Robert Jasiek compares the two in detail at http://home.snafu.de/jasiek/difference_2_korean_rules.html. More important, IMO (a lowly 3dan), some explanations seem plainly wrong - at least food for Robert Jasiek. Most probably Robert will have discussed that one already somewhere and somewhere else. Take e.g. 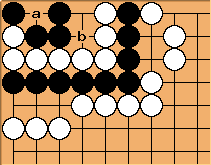 The Additional Rules (Article 1,2) http://english.dashn.com/english/korea_baduk/koreabaduk_05_08.htm reading: "In Figure 3-2 White 1 should be sufficient to capture all the Black stones. If white has clearly more Paegam no further move is need. " while the figure shows a mannen ko. There are many more examples which I do not understand. Besides an improvement of the English seems necessary. Who would like to participate in the job? The website gives a telephone no. First one should phone and ask whether they appreciate any improvement at all and ask about the - several - rule inclarities (could derive from a Korean to English translation as well). There is an old Korean variant of go called Sunjang Baduk. This has very different rules. iopq: I guess under Korean rules, ko fights where one side has obviously more ko threats are not necessary - which under territory counting means you can leave a ko unresolved because you have more ko threats. That means an additional point of territory for the person who doesn't need to play. Does anyone know the komi for Korean rules? Is it 6.5 or 7.5? iopq: According to the diagrams on the site, the two Black stones are alive! I guess it would take playing two white stones to kill them, but isn't that counter-intuitive? Bildstein: But to capture them, White must give up two of his stones. iopq: Oh, I get it now, thanks. Although wouldn't you prefer to play the sequence out? Then you get a small ko threat and eliminate one. Bildstein: No, I don't think so. As it stands, Black has one point and White two (which won't change if Black throws in to make a seki, because White will get a prisoner). If White plays and captures, White ends up with four point in the corner (two territory and two prisoners), but Black ends up capturing two stones and getting two points of territory also, so the net result is that White loses the one point local lead that he had. Harleqin: I don't know. Do Korean rules count points in seki? Japanese do not. jms: I'm not sure if Korean rules count points in seki, but if they do, then it amounts to the same thing. If black forces a seki, then its one point to white from the capture, but if white plays it out, its 4 points each (as previously shown) and therefore even, so white loses a point by playing it out. ... If neither player moves and the game ends, how do you score it? As seki? Bill: Korean rules do not count points in seki. Owen- I'd probably be willing to help with editing an english copy of the rules if needed, although I don't know Korean. In any case, the link posted doesn't seem to lead anywhere. 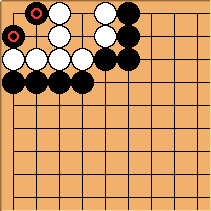 In the Japanese rule, two passes occur at this shape, all the black stones are dead, and there is a one point difference from the Korean rule. I believe one can regard that this version includes all the modern ideas of the Korean rule, and changes made afterwards are just rewording the existing rules and adding examples. I cannot make a thorough check of the Asian Game 2013 rule linked below, but a quick glance suggests that it is practically equivalent to the current Korean rule (and it's written in English!). One consequence of the new rule is that localized moonshine life does not die because there are infinite local ko threats. If the "attacker" is not willing to settle with a seki, repetition of the same whole-board position will occur, and the game ends with a draw. There are also the Asian Games 2013 Rules with their Attachment 1 and Attachment 2. Robert Jasiek has written a commentary on them.